Finally, the time has come and the report we have all been waiting for has been released. At 228 pages in length it’s a bit of a slog, and with a great deal of emphasis on the past. There’s talk of all the familiar faces – the tales of Hein, Lance and Pat are covered at length. We hear about the 1990s and the ‘period of containment’ that focused on limiting the health risks of doping rather than a policy focused on catching every wrongdoer. Many pages are dedicated to failures in governance that occurred a decade or more ago, and there’s even a section walking us through the history of doping. We all knew how bad the past was – and now we have an official document to prove it. Almost as soon as it was released we saw a number of all-encompassing summaries of the report, including articles by the always great inrng, and Peloton magazine. Rather than focus on the past though, I want to look at what it the report has to say about the current state of cycling, and what it could mean for the future. Here’s a look. With the cesspool of the 1990s behind us, and the Armstrong years already covered ad nauseum lets fast forward to 2006. The period from that year to 2008 is highlighted by CIRC as a turning point in the fight against doping. “Steady improvements and a growing willingness to combat doping at its roots” are cited. It was indeed a period of change. At the UCI’s anti-doping unit with Lon Schattenberg (a man who shared the same ‘avoid scandals’ mindset as Verbruggen and McQuaid, notably writing letters to teams informing them of drug detection windows) left to be replaced by the Australian Anne Gripper. 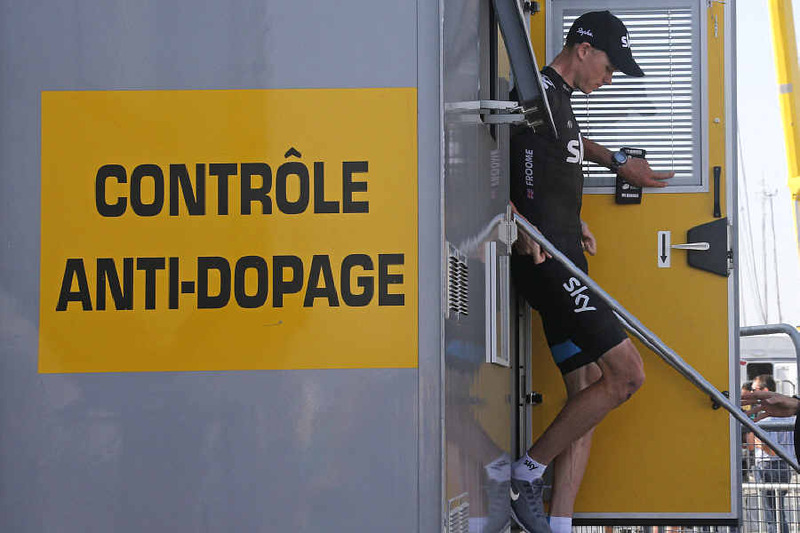 Other changes in personnel included the dismissal of a large number of doping control officers, described as receiving little training, prone to leaking information and often being close with teams. With Gripper came a raft of changes. 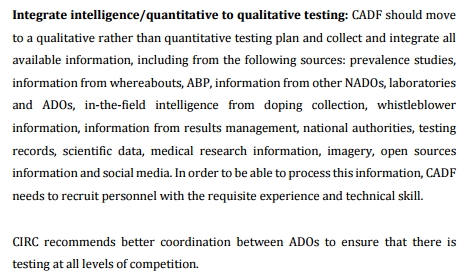 Targeted testing was brought in, while more and more out-of-competition tests were carried out. The Cycling Anti-Doping Foundation (CADF) was also introduced during her time at the UCI and funding for anti-doping was increased. An often unnoticed part of the fight – the introduction of post-race chaperones is also noted. 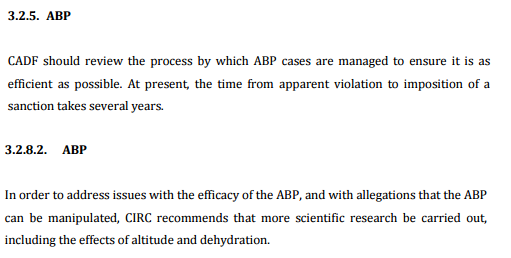 The biological passport (ABP) was brought in under Gripper’s watch in 2008 and has been hailed as a big advance in anti-doping. 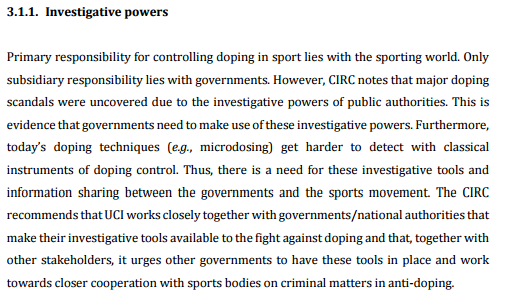 We have seen in the past that it isn’t a foolproof tool though, and the report tells us that there are deficiencies for riders to take advantage of – much like the 50% rule, it limits how much riders can dope, rather than eliminating doping altogether. Further criticisms of the passport include the lengthy procedures involved in sanctioning riders (the Menchov and Kreuziger cases are cited), and the “conservative approach” of some of the ABP experts in wanting to pursue ‘doping scenarios’ thanks to the difficulty of analysing nuances in data. While we have seen dopers hide behind excuses like training at altitude or dehydration before, but they can be legitimate reasons for odd blood values. It’s a fact that only makes the job harder for the experts. So how clean is cycling today? One rider was asked about cleanliness levels in the peloton and put the figure at 90% but said he thought that “there was little orchestrated team doping” anymore. Another rider felt that 20% were doping, while many stated they just didn’t know who was clean and who was not. Of course, we don’t know who these riders are, so we have little idea of which figure is closer to the mark. And that’s before we get to the question of what riders view as ‘doping’. Meanwhile new methods of doping such as ozone therapy and AICAR are brought up, while CIRC also includes a staggeringly long list of substances that riders are currently using, or have been during the past few years. There’s even a small section dedicated to the possibility of mechanical doping, something that has been raised several times in the past. These answers aren’t surprising, but they aren’t heartening either. None of us can safely say which number is more accurate, but we do know that the days of massive gains from doping are gone. The report echoes this, saying that “10-15% gains have become a thing of the past.” Instead, performances are enhanced perhaps 3-5% by new techniques such as microdosing. So the playing field still isn’t a level one, but going by these figures it’s more level than it used to be. Despite the heartening numbers, more work still needs to be done, as CIRC notes a number of ways in which riders are still gaining an advantage. The problems with the ABP have been outlined above, but there are further loopholes for riders to take advantage of. The no-testing window between 11pm and 6am is one. 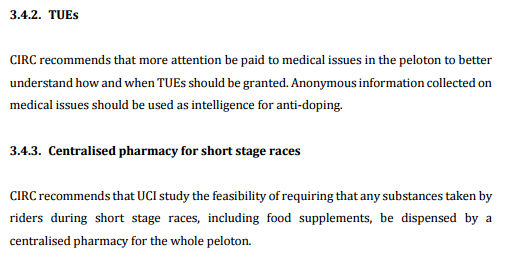 CIRC states that, “riders are confident that they can take a micro-dose of EPO in the evening because it will not show up by the time the doping control officers could arrive to test at 6am.” This is a difficult problem to solve though, with the human rights of riders factoring into the equation. Often a controversial topic, TUEs are another problem, with interviewees reporting that they are “systematically exploited by some teams and even used as part of performance enhancement programmes.” The abuse of corticoids and insulin in particular raise concern, while there was also a feeling that obtaining a TUE is too easy. One anonymous doctor told CIRC that corticoids were often used for weight loss as opposed to their stated function of pain relief. Finally, concerns are raised regarding the use and abuse of substances not on WADA’s banned list. One rider talked of a ‘pill system’ he used, which involved him taking up to 30 pills a day, while also reporting the use of tranquilisers and anti-depressants on his team. The report lists a various array of nutritional and homeopathic substances along with painkillers, caffeine tablets, Viagra and Cialis, with CIRC having been told that all were taken with the sole purpose of substance enhancement in mind. Just think back to the Kovalev brothers to get a glimpse of what this looks like. 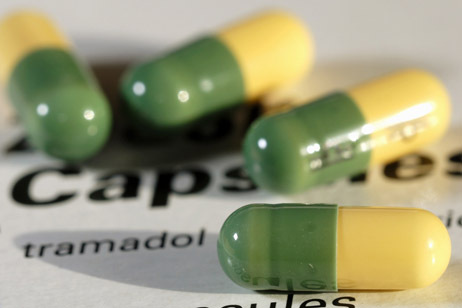 Tramadol use has also been in the news in the recent past. It cropped up again here, with interviewees of the opinion that if a rider needed to take it then they shouldn’t be racing. Similar sentiments were recorded regarding corticoids. So no revelations then, but a lot of information about what is going on in the peloton today. Or at least what is presumed to be going on – the lack of evidence and a reliance on hearsay is a problem. Proof is hard to come by though, and in this case we have to make the best of what we’ve been given. There are some disappointments – look at the list of names and you only see 16 riders with Chris Froome the only non-retiree. Ten others have declined to be named, but Francesco Reda and Mauro Santambrogio are dead certs. 26 is still a very low number though, and the question of credibility comes up. In any case, it’s less important to dwell on the individual stories than it is to think about what can be done in response to the report. While everything we have read might not be totally reliable, the raft of ideas that have been proposed seem, on the face of it, to be very useful. At this stage they are somewhat vague but each idea is something the UCI needs to take notice of. There’s talk of intelligence sharing with governments as well as more intelligence gathering within CADF. On the testing side we read about re-testing samples and testing riders at night. Also mooted are sound ideas like a whistleblower desk, a review of the TUE process and improvements to the ABP. 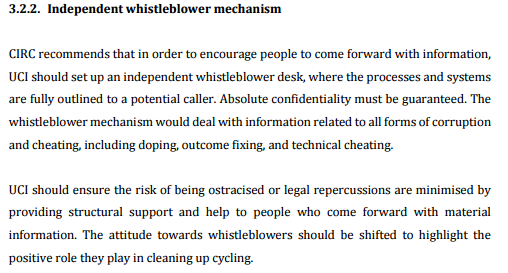 If the UCI has changed – and both the commissioning of this report and the contents within point towards that being the case – then we can cross our fingers and hope that changes like these will be implemented. There’s still a long way to go, but things can get better.